Home / Tips / Is There a Best Day of the Week to Clean Your Home? 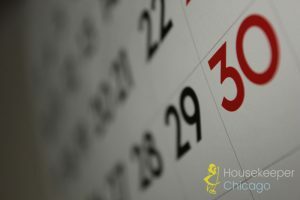 Is There a Best Day of the Week to Clean Your Home? Time is one of our most important resources nowadays and people hate wasting it on non-pleasant activities. This is why cleaning your home is among the chores you perhaps look to avoid at all costs. It is not the physical aspect that scares people off, but rather the time needed to complete a boring activity. If you look around the Internet you will find many articles suggesting how to organize your home cleaning situation in order to make it bearable and easier to conduct. Some suggest that you come up with some sort of a schedule so that you know when and what to clean. So is there a special day that is best for home sanitation? Perhaps not and this is what we will discuss below. It is a common belief that the weekend is the best part of the week to maintain your home. But imagine what this means for your free time. You likely have 2 days off weekly and spending one of them cleaning your home instead of going somewhere with your family is sort of sad. There’s more. During the time you clean your home you might discover some little things that need fixing or changing. If you do that on a Sunday then the stores nearby are likely closed. This is another good argument against cleaning during weekends. If you discover small projects at your home such as renovations or repairs then you cannot tend to them immediately and will need to wait till the next day. This way you will start procrastinating and your little project might never be finished. Others try to do it on a working day. We need to clarify that despite discounting the validity of the idea that you should clean over the weekend we do not agree with cleaning during the week as well. At least not on just one day. Now if you try to pull off a full house cleaning on a Tuesday after work then we got news for you – it won’t work. The best way of approaching all of that is to distribute your chores equally during the week. Yes, this is the Holy Grail of home cleaning. Do a little every day and you will never feel very tired or bored from cleaning. For instance you can do some dusting and vacuuming on Monday. Never separate these two activities as their effect will practically disappear. Dusting will send many particles on the ground and on your carpets. You should vacuum clean immediately after that for maximum results. Steam clean your floors on the next day. Do some washing of clothes on the third day so that you can have a fresh batch for the rest of the week and the weekend. Window washing is perhaps the one chore that you do not need to do weekly. Come spring time whip out the brush and the mop and climb on that ladder. Make your windows shine again.